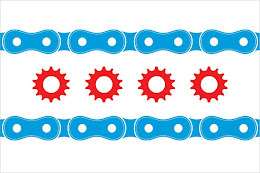 Chicago Bicycle Accident Lawyer | Illinois Bicycle Lawyers at Keating Law Offices: Bailout Bill to provide "Bicycle Commuter Benefit"
Bailout Bill to provide "Bicycle Commuter Benefit"
The Chicago Tribune reported today regarding the Bicycle Commuter Benefit Bill. This label is slightly misleading in that the bill that was passed by Congress and signed into law earlier this year by President Bush, has little to do with bicycling. This amendment to the existing law came as a part of the $700 billion dollar financial bailout package. Basically, the benefit provides that starting January 1st that employers can receive a $20 per month tax break for expenses incurred by their employees when the employee rides their bike to work. The catch is that the bill doesn't exactly layout how the employee (i.e. the bike rider) will receive the financial benefit. In all likelihood, some kind of system like the CTA card would have to be put into place where for every month a bicycle commuter rides to work they could receive the benefit. Just like the CTA card is used to deduct fares, the bike commuter card could be used like a debit card for purchases/repairs at participating bike shops. Like a lot of things, it will be interesting to see how this plays out in practice rather than in theory. One way or another, it is good to see Washington put forward some very practical pro-bicycle commuter legislation. ‘(i) QUALIFIED BICYCLE COMMUTING REIMBURSEMENT- The term ‘qualified bicycle commuting reimbursement’ means, with respect to any calendar year, any employer reimbursement during the 15-month period beginning with the first day of such calendar year for reasonable expenses incurred by the employee during such calendar year for the purchase of a bicycle and bicycle improvements, repair, and storage, if such bicycle is regularly used for travel between the employee’s residence and place of employment. ‘(II) does not receive any benefit described in subparagraph (A), (B), or (C) of paragraph (1).’. (d) Constructive Receipt of Benefit- Paragraph (4) of section 132(f) is amended by inserting ‘(other than a qualified bicycle commuting reimbursement)’ after ‘qualified transportation fringe’. (e) Effective Date- The amendments made by this section shall apply to taxable years beginning after December 31, 2008.